The Liberator Aluminum Curb Ramp assists the operator with going up and over curbs, raised doorways, and up single steps. B&P's exclusive process punches holes in the material then raises the edges of the cutouts for superior traction. Exceptionally light weight design won’t collect ice, mud, snow or debris. Handle slot doubles as support leg. * Yellow Powder Coat – Increases Visibility and Traction. * Attached handle on underside adds portability and doubles as a support leg. 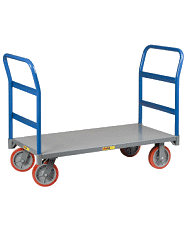 Overall Dimensions 30 x 30"
Hand Truck Ramp 26" X 18"